After the recent financial crisis in 2008, Greece was left to deal with its crippling debt burden, the result of a devastating recession, coupled with extortionate government spending. Six years of continuous economic slump caused the unemployment rate in Greece to rise to a record high, and reduced the size of its economy to a quarter of its previous size before the crisis. Greece had to resort to austerity measure in hopes of improving its budget balance, as well as receiving bailouts amounted up to approximately €240 billion from its fellow Eurozone members lest it defaults on its loans and affecting the economies of other European countries. Recently Greece has predicted returning economic growth and ease up its austerity tax rates with optimistic hopes for recovery. At the moment, Greece is experiencing negative growth in its economy, with a -0.4% GDP growth in the first quarter of 2015comparede to the previous quarter. Greece’s current GDP is around €226 billion, a reduction of €232 billion since 2014 fourth quarter. Greece’s GDP has been falling continuously after the financial crisis since its peak in 2009 at €320 billion. However, there is an increase in annual GDP growth of 1.2% in the fourth quarter of 2014 over the same quarter of the previous year, which might hint toward a slight recovery for Greece. Nevertheless, compared to its projected trend GDP growth of 2.9% for 2015, Greece still suffers from a significant negative output gap of 3.3%. The current position of Greece’s economy can be illustrated using an AD/AS graph. Consumer spending in Greece reached its lowest point in 2013 at €26,383 million, however rising up to €33,134 million in the last quarter of 2014, showing an improvement in consumers’ confidence. Depressed consumption might be due to Greece’s credit crunch, with consumer credit at the moment coming to a total of €26,136 million. Even with interest rate as low as 0.05% in recent time, it is still unable to stimulate consumption to a higher level. Unemployment has reached 26% as at December 2014. This is an improvement compare to its peak at 28% in 2013, but nonetheless is still disturbingly high. High unemployment rate in Greece can be blamed on the persistent depression as well as the austerity policy that Greece has been running on. Austerity taxes on income reduced incentives to be employed, while corporation taxes diminished demand for labour. Greece is currently having a Balance of Payments deficit of €1,267 million, with a Current Account deficit of €870 million. Greece’s imports come to a total of €3,131 million, and exports equal to €1,864 million. The inflation rate for Greece’s economy is -2.2% (deflationary). Interest rate has been lowered to as far as 0.05%, but deflation is persistent due to the lack of consumption and investment. Demand is low due to high unemployment, along with a lack of welfare benefits due to austerity measure, lead to a lost in spending power by consumers. This reduces consumption and increases savings, which is a leakage from the circular flow of income. This means that there is no incentive for investment since there is weak demand, eventually leading to redundancy of workers and higher unemployment, which would further lower aggregate demand (according to the multiplier effect). Over the past six years, Greece has spent a significant amount on public spending in hopes of bringing its economy around for recovery. Greece is currently running an enormous budget deficit, with its national debt quickly approaching 180% of its GDP by 2013 and had to resort to bailout money from other Eurozone countries. This is because Greece’s negative credit rating left it without an investor who would be willing to lend it money to repay its national debt. The consequence of receiving the bailouts was the imposition of austerity policy, and consequently leads to a 20% contraction of Greece’s economy. The International Money Fund (IMF), the European Central Bank (ECB) and the European Commission – commonly referred to as ‘Troika’ – imposed a privatisation program with a set target of €2.6 billion revenue in 2013, a highly unrealistic demand that required Greece to sell off state assets in order to raise the amount. Greece’s total debt has amounted up to €323 billion, with 60% of it owing to the Eurozone and 10% owing to the IMF. As of recently, based on the more positive signs of recovery in the Greece’s economy, Greece’s Prime Minister, Alexis Tsipras, is renegotiating the terms of the bailout, specifically with the intention of dropping the austerity measure and possibly “a major debt write-off”. “He is trying to persuade EU leaders that proposed reforms are enough to unlock vital funds, needed to avoid possible bankruptcy and a Eurozone exit”. According to BBC (2015), Greece has proposed the following reforms: creating a fairer tax system, combating tax evasion, tackling corruption, targeting fuel and tobacco smugglers, implementing labour reforms on collective contracts and bargaining agreements, tackling Greece’s “humanitarian crisis” with housing guarantees and free medical care for the uninsured unemployed. Even with agreement from international creditors to extend Greece’s bailout of €240, there are still fierce disagreements coming from Eurozone creditors, such as Germany who are unwilling to accept the extension. If Greece is unable to receive an extension on its bailout money, it is extremely likely that it would default on its debt, leading to serious consequences. In the situation where there is no extension of bailout money for Greece, it would not have the ability to repay its massive national debts (including bailout loans as well as government bonds owned by investors). Greece would face bankruptcy by the time it leaves the Euro. Its new currency is likely to fall in value due to Greece’s economy position, leading to increasing cost of imports and affect living standards as people and firms are no longer able to finance their purchases of imports (which is high in demand according to the balance of payment deficit). Exports might become more competitive thanks to the lower exchange rate of Greece’s new currency in the future, but the immediate effects would be a deterioration of Greece’s economy. Greece leaving the Eurozone can also affect the credit rating of other countries like Spain or Italy, since international creditors would be wary about lending money to struggling Eurozone economies. This may lead to these countries requiring bailout money, which Eurozone would find difficult to provide due to the size of these countries’ economies. They might even have to face imposition of budget cuts and austerity measure if they turn to the IMF for funds. There are different possible approaches for Greece regarding their current situation. From a Classical Economic perspective, Greece should try to balance its budget using austerity measure. This can be achieved through increasing tax revenue as well as reducing government spending. It is obvious that in a situation like this, it is difficult for Greece to try and reduce its budget deficit. Without stimulation of aggregate demand through government spending, Greece’s economy will have a hard time getting out of its prolonging depression. Increasing taxations also have an adverse effect on employment. High income tax reduced the incentive to be employed, while high corporation tax means higher costs for firms and so lessen their demand for labour. Increase in costs due to taxations shifts the short-term aggregate supply leftward, and so reduce total output of the economy. On the other hand, according to the Keynesian view, it is advised that the deficit can be deal with later and stimulating the economy is prioritised. Expansionary fiscal policies using taxations and government spending can influence the level of activity in the economy. Reducing taxations provide people with the incentive to work, as well as encouraging firms to hire if corporation tax is lowered. With more people working, national income would increase. Demand would rises if people have more spending power due to higher national income, and consumption would increase. According to the multiplier effect, this would lead to investment increasing as firms now see that there is an incentive to produce, and so national GDP would go up. Supply-side policies can also be implemented, if government spending on infrastructures, health care or education is increased, which help to increase the productive capacity of the economy and achieve a more sustained economic growth in the long run. However, this is only theoretical speaking, as Greece cannot continue to run on its increasingly unsustainable budget deficit that it can no longer finance. 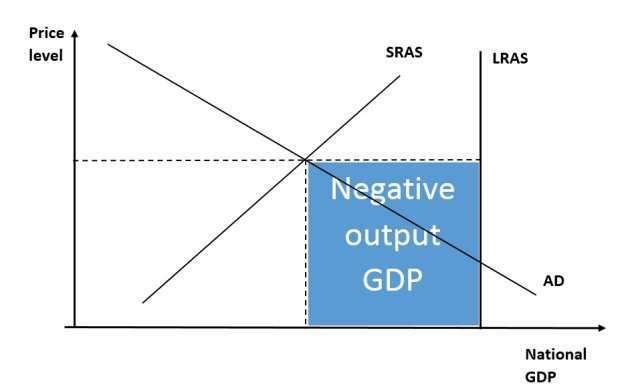 Monetary policies are unlikely to be of any use in this case, as can be seen with the already low interest rate of 0.05% that has no impact on reviving aggregate demand. Consumption and investment are still low even with loose monetary policies, without improvement on Greece’s deflation. Even with the risk of defaulting on a massive national debt used to finance the budget deficit, a Keynesian approach would enable Greece to stimulate the economy and start to recover from a prolonged period of depression. This would require the negotiation for extend bailout to succeed, without any austerity imposition. "Macroeconomic Analysis of Greece." UKEssays.com. 11 2018. All Answers Ltd. 04 2019 <https://www.ukessays.com/essays/economics/macroeconomic-analysis-greece-3993.php?vref=1>. "Macroeconomic Analysis of Greece." All Answers Ltd. ukessays.com, November 2018. Web. 19 April 2019. <https://www.ukessays.com/essays/economics/macroeconomic-analysis-greece-3993.php?vref=1>. UKEssays. November 2018. Macroeconomic Analysis of Greece. [online]. 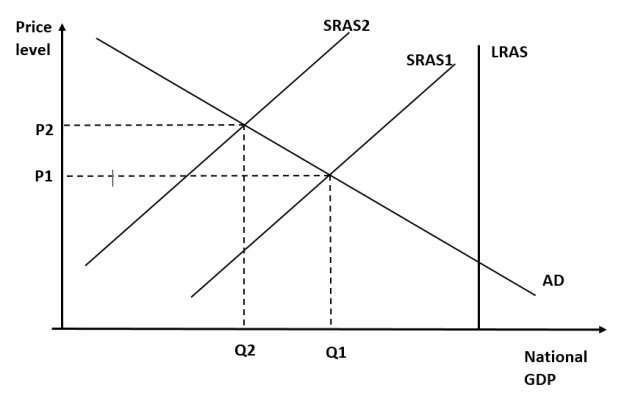 Available from: https://www.ukessays.com/essays/economics/macroeconomic-analysis-greece-3993.php?vref=1 [Accessed 19 April 2019]. UKEssays. Macroeconomic Analysis of Greece [Internet]. November 2018. 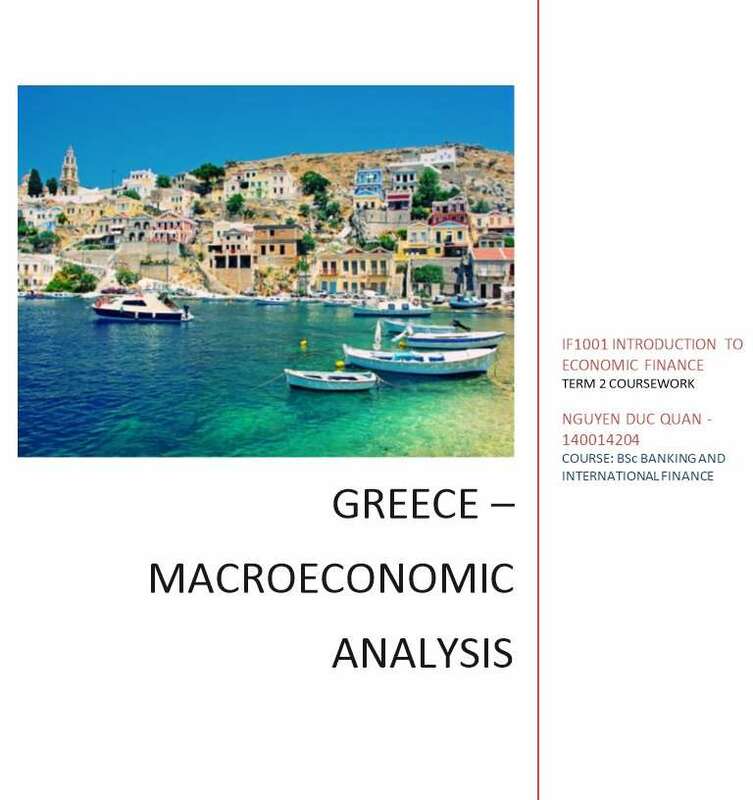 [Accessed 19 April 2019]; Available from: https://www.ukessays.com/essays/economics/macroeconomic-analysis-greece-3993.php?vref=1.